Matthew Zook of ZookNIC, a business that analyzes domain names, said domains that start with “my” more than tripled between 2005 and 2008, to 712,000 from 217,000. According to the government’s Patent and Trademark Office, the number of trademark applications to register marks that include the word “my” increased to 1,943 last year from 382 in 1998. As a nation it seems to me that we are stuck in toddler, ‘It’s mine’ mode. Our mothers must not have done a very good job at explaining the true meaning of ‘You need to share’. We are a nation suffering from maladaptive narcissism, unable to see beyond our own wants. Of course, there are some hopeful signs with the popularity of the Obama, ‘Yes We Can‘ campaign, and Al Gore‘s attempts to rally people with ‘We Can Solve It‘. But then, one needs to question the scope of the ‘we’. There is a real arrogance in thinking that ‘we’ the Americans have the solutions, and can decide what’s best for the whole planet. On Earth Hour Day, the Spotlight Is On the Lights . . .
Earth Hour was created by WWF in Sydney, Australia in 2007, and in one year has grown from an event in one city to a global movement. In 2008, millions of people, businesses, governments and civic organizations in nearly 200 cities around the globe will turn out for Earth Hour. More than 100 cities across North America will participate, including the US flagships-Atlanta, Chicago, Phoenix and San Francisco and Ottawa, Montreal, Toronto and Vancouver. View cities involved around the world. We invite everyone throughout North America and around the world to turn off the lights for an hour starting at 8 p.m. (your own local time)-whether at home or at work, with friends and family or solo, in a big city or a small town. Join people all around the world in showing that you care about our planet and want to play a part in helping to fight climate change. Don’t forget to sign up and let us know you want to join Earth Hour. Not only do we need to remember to turn off our lights during the night, we also need to not turn them on during the day . . .
A trip to the neighbors across the street is almost always a culture shock. A peak into the reality of American culture and its excesses. This time, was Russell’s one year birthday party. You could tell from the street, by the balloons and the SUV’s parked in front. To get to it, we had to make our way through the house, and all the plastic toys, strewn all over the floor. I did not remember children needing so many things to play with. More was in the wing. It was impossible to ignore the mountain of presents waiting in the corner of the living room. We found the crowd, outside, celebrating, with enough food to feed an entire block, and disposable plates and plastic cups, of course. 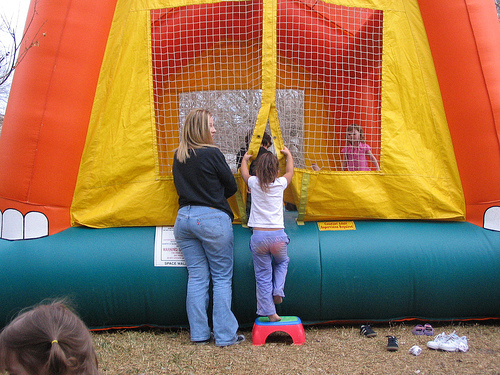 Kids and adults kept coming in and out of the obligatory bounce house. I asked Prad what kept the thing inflated. He assured me it only took minimal energy. Plus everybody seemed to enjoy the jumping so much. Little Russell, oblivious to the occasion and a big smile on his face, was cruising around, playing with a plastic straw and picking at the grass. Life seemed so easy, and happy, and abundant. I should have been rejoicing. Instead I felt unease. Displayed in front of me, was a graphic manifestation of unconsciousness, that did not sit well with my green conscience. Prad accused me of being a party spoiler. ‘You are going overboard now. You can’t stop people. They are celebrating the happy event with their community.’ I could not disagree with the community part. It was the ‘how’ that bothered me. Before the dawn of plastic, what did people do? I asked. Wasn’t the party for Russell anyway? The contrast between Russell’s happiness with so little, and the amount of stuff that seemed necessary for everybody else to have a good time, seemed so obvious to me. Last week, Andrew Revkin asked the DotEarth readers to ‘Imagine Everyone Was Equal In Emissions‘. What would it mean, knowing that currently the average American is producing about fifteen times as much as a person from India or Africa? It means Russell’s parents would have to live a very different life. No brand new toys, or at least not so many. No SUV. No flat screen TV running while nobody is watching. No disposable plates. Less food. Less meat. It means adopting Kyle’s ‘One Tonne Carbon Lifestyle‘, recognizing that there are indeed limits to what we can do and consume. And that such a change is not the end of the world, but instead the beginning of a new, more conscious way of living. Twice a week now, I commute to San Francisco for a consulting assignment. Instead of driving, I take the train. Altogether, I get in my one hour of exercise, walking to and from the train station, and two hours of work in the train. Carbon emissions: minimal. Personal efficiency: maximal. This is what Kyle’s One Tonne Carbon Lifestyle is about. Can you think of one way that you can change your life that is all benefit to you, and to your environment? EcoMoms have made it to the front page of the New York Times. This is an impressive group of green moms, 9,000 altogether, and growing strong. A group that is representative of a very active subculture in Northern California where I live. These women are on a mission and nobody can resist them, not even their husbands or children. They fill Whole Foods‘ parking lot with their Priuses, and are not shy about voicing their newly found green convictions all over the blogosphere, as in here, and here, and here. Reading the article, one would be tempted to think that all is well on the mommy’s front, environmentally speaking. Until reality steps in. This morning, a friendly visit to my four year old neighbor’s house turned into an anthropological tour of American consumerism at its worst. Little Rachel wanted me to blow bubbles with her, and took me to her backyard. There, sitting in the middle of her parents’ picnic table, a big plastic thing dared me with its massive plastic construction. 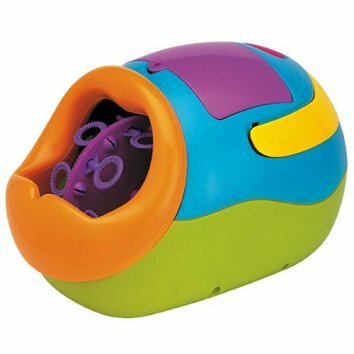 The Iplay Outdoor Bubble Machine from Target, ‘has a large capacity bubble mix tank for high volume bubble production’ and has a five star ‘guest rating’. It can be yours for $24.99. The Iplay Outdoor Bubble Machine, unfortunately, is more representative of the reality of American moms today, than the EcoMom Alliance. I only need to look at myself to understand why. As a mom, I have found it incredibly hard to resist the temptation of materialism, and I have documented my struggles often in this blog, as in here, and here, and here, and here. This being said, women do represent a positive force for the climate fight, as supported by all the latest research.